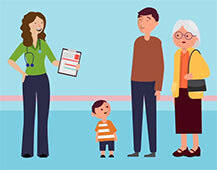 Surrey Heartlands is a partnership of health and care organisations working together with residents and patients to improve services for local people. The population covered is around 888,000, with 0.7 per cent living in the most deprived areas of England. The area is predominately urban, with three A&E sites around 30 minutes apart. Approximately 13 per cent of the population lives rurally. The partners are embracing devolution from April 2018, which will mean more local control through devolved budgets and access to further transformation funding. Surrey Heartlands is currently refreshing its priorities and plan, with a strong focus on the first 1000 days of a person’s life, and also looking at the wider determinants of health. By working together with the people of Surrey Heartlands, the partners aim to support people to be healthier, provide high quality and accessible care for those who need it and create partnerships that work better for local people and those who provide care. Changes will include focusing on prevention, healthier lifestyles and the wider determinants of health, removing unwarranted variation in care, providing care in the right place at the right time, and taking opportunities such as devolution and digital innovations to make the best use of collective resources. Surrey Heartlands has also made a commitment to the first 1,000 days of someone’s life, in recognition of the importance of the first 1,000 days in terms of health inequalities – if a child enters school with a health inequality gap it is unlikely to close later in life. The Kent, Surrey and Sussex Academic Health Science Network is delivering an exciting project that aims to reduce the number of people at risk from atrial fibrillation-related stroke. In all, 96 mobile ECG devices have been distributed to a range of settings including community pharmacies, GP practices, community nurses, prisons, patients’ homes and community hospitals. These units can be used to carry out opportunistic pulse rhythm checks and identify people who have atrial fibrillation (AF) so that appropriate care can be provided. The devices have been shown to be an effective, low-cost solution for identifying new AF and reducing the risk of AF-related strokes.